← Pamela gets a mosaic business card holder! Glass doesn't always participate the way I expect. Ah, the unpredictable reality of glass. I like to think I can anticipate how glass will break or cut with some degree of accuracy, but no. My art is still largely unpredictable! For example, consider the image above. I needed two matching sheets of glass to sandwich an image between in a piece I am currently working on. I rooted around in my studio and found two identical sheets that I had picked up curbsiding last spring. Perfect! I measured and scored and tried to snap the score to create a clean break. Nothing. Hmmm. Maybe it’s because it’s thicker that the stuff I usually use. Score again. Try to snap the line. Nothing. At this point, I’m scratching my head. It’s GLASS for goodness sake. I should be able to cut it. So I get my wheeled nippers, still thinking it’s not cutting because it’s too thick. One TINY little nip with the nippers and POP! The sheet EXPLODES into little tiny cube-shaped fragments. Ha! It was tempered glass! 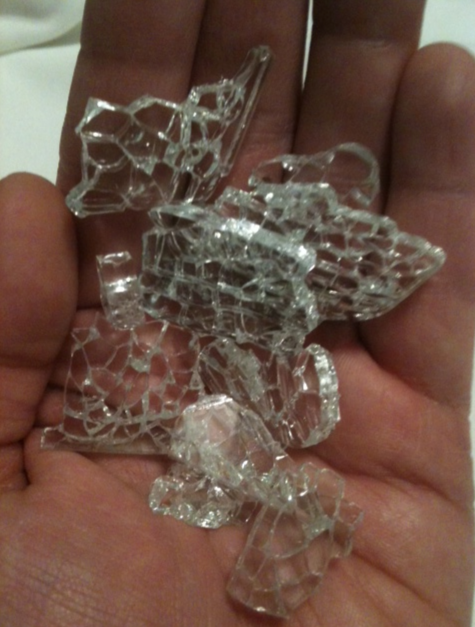 I immediately (and gleefully) shattered the second piece! Expect the unexpected. And always wear your safety glasses.